My best friend’s older sister, Lauren Gomes, also worked for Mountain Challenge. She recruited me to both Mountain Challenge and Maryville College. I interviewed for the fellowship but didn’t receive it, upon arriving at MC I started shadowing with Mountain Challenge in my first semester. I believe it would be a combination of all the hours spent driving on bike trips. It’s an odd one, but it gave me excellent time to just be and think with intermittent bouts of human contact. The placement of those trips in my college career and intellectual development was ideal. It made me appreciate the journey and realize how important movement is to me. I’ve rarely been happier than when I was traveling back country roads completely absorbed in the experience and process of driving for the bike trip. Since graduating in all the jobs I’ve chosen I’ve focused on whether I thought the experience and process would be fulfilling rather than the paycheck. I’m certainly not rolling in money, but so far I’ve been rather satisfied with my choices. Removing a tick from Travis at a small Mexican restaurant in rural TN with nothing but the items on our table. If I remember correctly, hot sauce mixed with lime juice was the final solution. 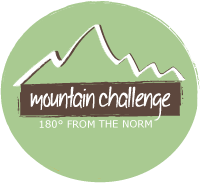 The community of Mountain Challenge is what sold me on the entire thing. Throughout my college career it was my home base. Crawford House was a place I could get away from all the other nonsense. I knew there would be people there who cared and would have a genuine conversation, having that meant a lot especially when things got rough. Looking back, nearly all of the friends who I’m in regular contact with and keep up with were tied to Mountain Challenge, I think there’s a reason for that.